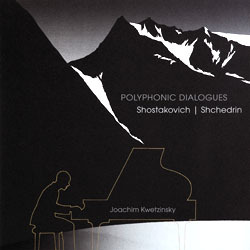 6moons.com music reviews: Joachim Kwetzinsky "Polyphonic Dialogues"
Beyond their exceptional friendship, can you evoke another common point between Dimitri Shostakovich and Rodion Shchedrin? You might mention the fact that both composed a set of 24 preludes and fugues for solo piano. And you'd be completely correct. Mixing selections from either set into a new arrangement now results in these Polyphonic Dialogues. This new evocation of complicity between Shostakovich and Shchedrin moves between the borders of tonality with rhythmic elements often derived from jazz. After the last Madsen outing, one imagines a definitive fondness by 2L artists for such intellectual exercises. Joachim Kwetzinsky is a relative newcomer to the Norwegian piano scene who still must find his own artistic signature. In my opinion, the young Kwetzinsky here delivers a very interesting recording already which highlights both the shared counterpoint passion of these composers and their differences of style and sensibility. In that sense it becomes a successful polyphonic dialogue. There is no cause of complaint for this type of performance since the personality of each composer does not represent the main focus. Rather, it resides essentially in the art of contrast. Granted, a four-handed performance between this young pianist and another talent like Madsen or Corea would have been more thrilling yet but this was conceived as a solo outing. To reinvent this masterwork on four hands would truly be a challenge. Any volunteers? End of digression. After all, we are not talking about polyphonic music but dialogue. I am personally fond of this exercise and always surprised to hear how J.S. Bach continues to influence contemporary modernity. As to the differences between the two famous composers, it seems useful to be reminded that Shostakovich’s 24 pieces are based on each of the major and minor keys of the chromatic scale whereas Shchedrin chose to span all the keys of the diatonic system. This contrast reinforces the notion of dialogue throughout the entire sequence of pieces. Nonetheless, Kwetzinsky’s preference seems to be Shchedrin whose modernity might have seemed more seductive. The first track "Basso Ostinato" illustrates the tense climate Shchedrin evokes through counterpoint. Perhaps the playful dimension is not completely recreated but the spirit nevertheless floats in the air and the two following preludes and fugues flow naturally. Shostakovich’s "Prelude N°2 in A minor" demonstrates a similar lack in fluidity which strikes me as completely natural for such a young pianist. This however disappears completely in the "Prelude & Fugue N°4 in E minor" where we encounter beautiful evidence of artistic serenity and maturity. Turning back to Shchedrin with his "Prelude and Fugue N°3 in G major", the young pianist finally decides to start the counterpoint game in earnest and introduces new dimensions like humor and rhythm. 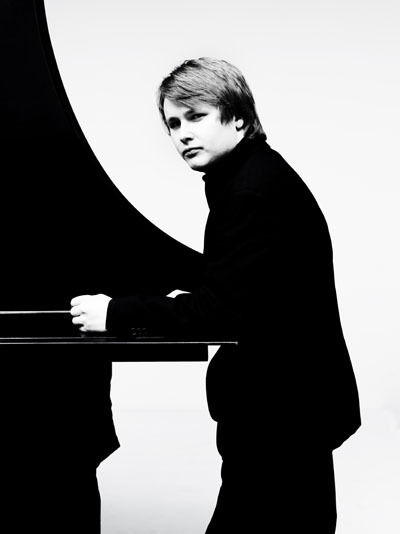 The project's game of contrast is fully revealed from this point onward and the bouncy Shchedrin score becomes the ideal contrasting foil to Shostakovich's serenity and delicacy. This intimate polyphonic dialogue ends with Shchedrin’s "Toccatina-Collage" (Polyphonic notebook) and offers very pleasant moments of playfulness, melancholy, irony and anger. I thoroughly enjoyed this tribute to the two friends’ complicity and duality. As usual for this Norwegian label, the sound quality is simply perfect. What a great effort, Mr. Kwetzinsky!